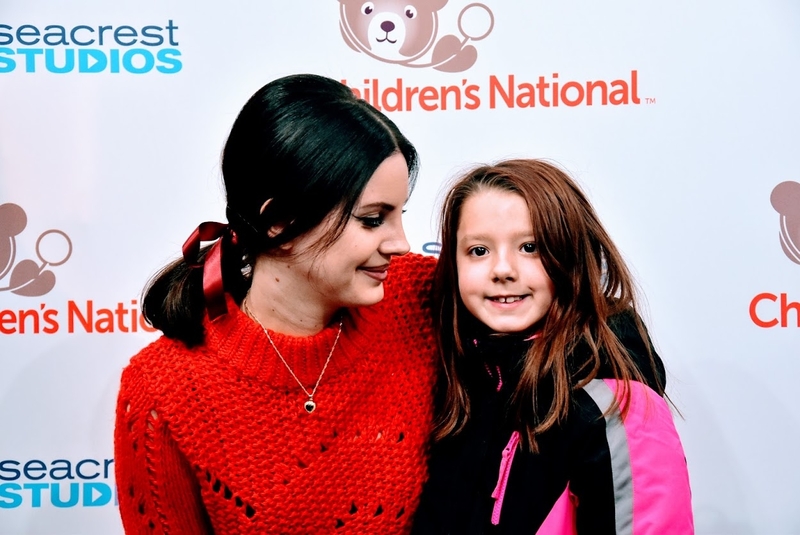 Lana Del Rey Brings all the Sparkle to Children's National! ---- Our friend, Lana Del Rey, stayed an extra day after her concert in Washington D.C. to make a special visit to Seacrest Studios at Children’s National! From the moment she was spotted through the studio’s glass windows at Children’s National, patients and families could not contain their excitement! The studio was packed with her fans and some of patients wanted to sit by the mics so they could ask her some fantastic questions! Lana told us all about what she’d been doing during her spare time in D.C., saying that she made a visit to see the White House with some of her friends. To everyone’s surprise Lana admitted she still has stage fright and gets super nervous before each performance. Lucky for the audience, however, Lana treated everyone to a private, up close and personal performance. She sang a few songs for us, including her version of “Once Upon a Dream” from “Maleficent”. She said that if she could put her own spin on any other Disney song, it would have to be something from “The Little Mermaid”. The room was filled with smiling faces as Lana warmed everyone’s spirit. Lana also filled us in on her pre-show routine, saying she loves to sing along to songs by artists like Whitney Houston and Ariana Grande to warm up her voice before her concerts. We also found out that she loves cats, and her favorite color is anything that glitters! After giving the patients some great advice on following their passions, Lana took pictures and signed autographs for everyone. One of the highlights of her visit was when a mother asked Lana for a special favor. It was her daughter’s birthday and she was a huge fan! Unfortunately, she was not in the studio for the visit. To the birthday girl’s surprise, Lana personally called her and sang “Happy Birthday” to her over the phone. Tears streamed down the mother’s face as Lana serenaded her daughter on her special day. It was a magical moment! Lana repeated how happy she was to be able to visit Children’s National. “This is where my heart is,” said Lana. Before leaving, she assured everyone she would come back again soon. Seacrest Studios can’t wait for Lana’s next visit! Lana, thank you so much for taking the time to visit us and good luck on the rest of our tour!